The California Democrat, the daughter of Jamaican and Indian immigrants, has started to carve out a reputation as a defender of migrants in the Trump era. SAN DIEGO — Sen. Kamala Harris, D-Calif., says she isn't ruling out a 2020 run for president in her most direct comments yet about her political future. In an interview that aired Sunday on MSNBC's "KasieDC," Harris said she's focused on the 2018 midterm elections. "I'm focused on a lot of other things as a higher priority" than running for president, she said. Pressed on whether she was ruling out a 2020 bid, Harris said: "I'm not ruling it out, no." Harris is viewed as a rising star in Democratic politics. Her likely presidential ambitions are the subject of wide speculation, and she's often included on the not-so-short lists of potential Democratic 2020 hopefuls. Harris, a former prosecutor, was California's attorney general before she was elected to the Senate in 2016. Harris — the daughter of immigrants from Jamaica and India — has started to carve out a reputation as a defender of immigrants in the Trump era, a move that could give her an edge with those voters in 2020. Earlier this year, she bucked her party's leadership to vote against an immigration compromise that she said made too many compromises with Republicans, angering some of her colleagues. Other possible Democratic presidential candidates in the Senate — including Bernie Sanders of Vermont, Elizabeth Warren of Massachusetts and Cory Booker of New Jersey — voted "yes." 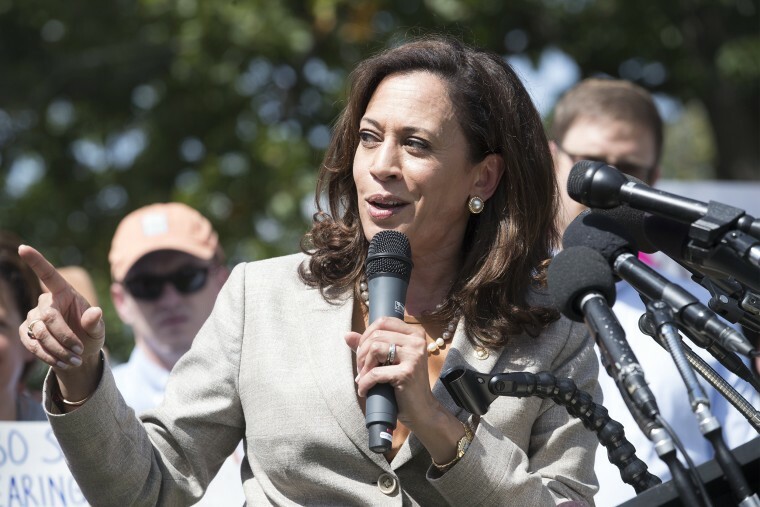 Harris made the comments about her future after she visited the Otay Mesa Detention Center, in the San Diego area just across the Mexican border. She spent Friday morning meeting with mothers who had been detained and separated from their children after crossing the border. Harris said the mothers claimed to have been separated from children as young as 5 years old. "We've got to critically re-examine ICE and its role and the way that it is being administered and the work it is doing," she said. "We probably need to think about starting from scratch."